It's a TIMEX, accurate to the T. Great Value...Great Watch... Only $. Can you believe it !!! My last TIMEX, STILL Works Fine after 30 years of Ownership but I'm tired of the Same Watch So I bought this new one. With all the running around you do, sometimes life feels like a Marathon. But with a Marathon by Timex watch on your wrist, at least you'll stay on track. I got this watch for my husband. He works underground and needed a watch he could read and since Timex offers IndiGlo, I picked this watch. Its an affordable choice and rugged at the same time. The band is made of a plastic material that can be wiped clean and thats a plus for underground work. Things get very dirty. The watch has help up wonderfully so far. This is a great everyday, knock-around watch. It keeps time perfectly, looks good and can be worn anywhere, even in the pool. I bought a second one (for less than $$, if I recall correctly) as a backup when the first one fails. But the original one keeps on ticking. I take it with me on vacation travel. If it's lost or stolen, no big deal. All in all, a very sensible timepiece. For the price it's a deal! You are able to view in the dark with a push of the glow button. With that said, I sometimes accidentally press one of 4 buttons and settings change otherwise it does its job. My husband wanted a watch for everyday wear while doing yardwork and such. This watch has served the purpose well. 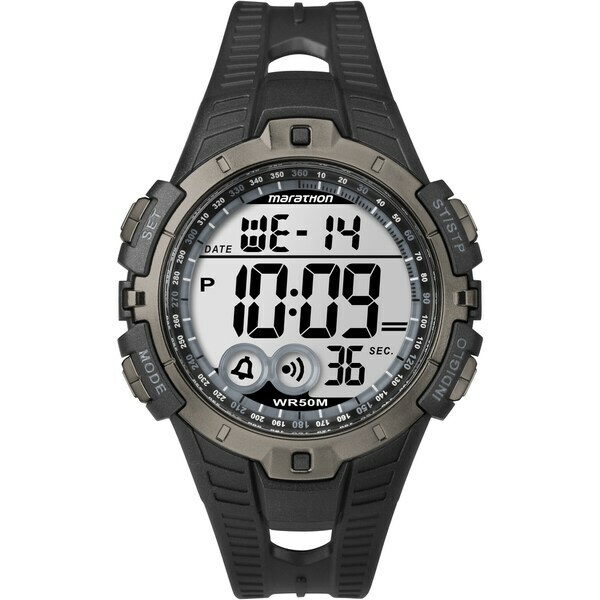 With a few Overstock Rewards and a couple of dollars I have the chronograph watch I wanted for my exercise routine. Amazingly simple, bold letters and numbers, it's perfect. Did I mention the Indiglo light? Very nice. Didn't pay much for this watch, so I was't expecting alot. That's exactly what I got. It lasted for about 2 months. gave as gift and it was received with satisfaction. Timex and the other that starts with a "C" are my go to sports watches. I exercise almost daily and I'm very hard on my watches. When I can get a bargain like the one on this popular Timex piece, I'll jump on it. Having the Timex brand and their stand-behind repair can be important.